Bass is a community thing…. As anyone who knows me will tell you, I’m pretty much addicted to all things Bass. I regularly attend gatherings of like minded individuals in far flung parts of the world like Newcastle and Manchester and contribute on a number of fora dedicated to the Low end. The main forum I spend my time on is hosted by the California based instrument maker – Alembic; I play their instruments and they’re very supportive, treating each customer like royalty.Â It’s through this forum that I’ve made friends with and met a surprising number of other musicians from all parts of the world. From Sam in Florida to Jan-olof in Finland, from Colin in Manchester to Bill in San Fransisco, everyone I’ve ‘met’ is as helpful and friendly as you could ever hope.Â One of these friends is none other than Jimmy Johnson, one of the worlds most in demand bassists having played with a list of performers as long as your arm. I first met him last summer when he invited me backstage at James Taylor’s manchester gig – that was some experience I can tell you; I got to meet one of my all time favourite singer songwriters (James) and he turned out to be one of the humblest people you could ever hope to meet. 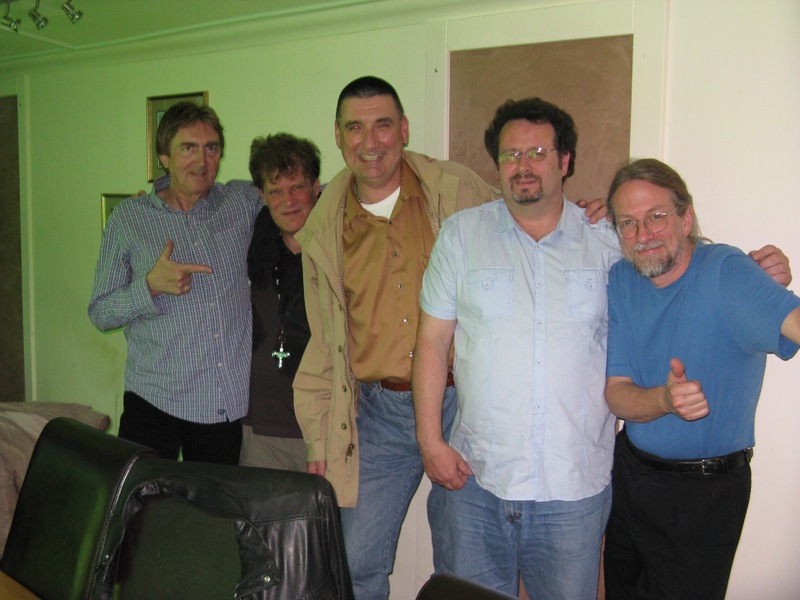 Since then, I’ve kept in touch with Jimmy both on the forum and by email and I was pleasantly surprised when he told me he was coming to Glasgow as part of the Allan Holdsworth trio along with Gary Husband on drums. As luck would have it, the Big Tuna gig scheduled for that night had just been cancelled so I jumped at the chance to see my mate playing some of the most complicated music you could hope for. It’s at this point that Jimmy showed just how nice Bass players can be. He had put Mike (another bassist) and I on the guest list for the gig and when we arrived came out from backstage for a long chat (not just about bass), almost missing the start of the gig in the process. The first set was incredible. Holdsworth’s music isn’t for everyone but if you like a bit of jazz fusion, he’s well worth seeing.Â Gary Husband was an eye opener. I’ve only ever seen him live with level 42 where he’s very much constrained by a strict 4/4 rhythm. 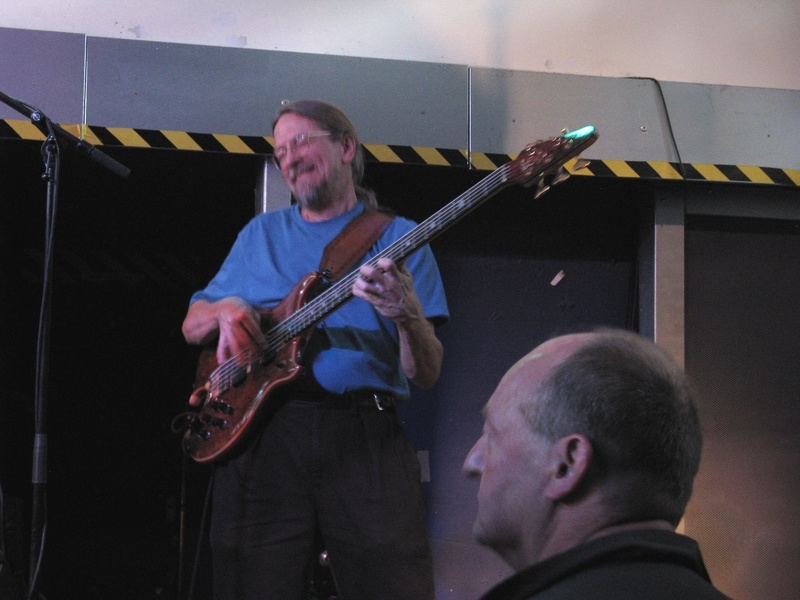 With Holdsworth, he can really let loose, playing some of the most complicated rhythms I’ve ever heard – and all the time, Jimmy Johnson was keeping pace and playing a blinding bass part. Â Â Â At the interval we were invited back to the green room where we had another long chat, particularly about Jimmy’s basses. He was the first player to specify a five string bass with a low B string (earlier 5 strings went up to C instead) and had commisioned the instrument from Alembic. His touring bass is a particularly nice late 70’s model with a beautiful walnut top which he was more than happy to hand over to me for a closer look. We also got chatting with Allan and Gary who, like all the other musicians I’ve met, were really down to earth guys and more than happy to spend time talking with people they’d never met before. Â The second set was even better than the first with Allan taking the music to places neither the drums or bass had been before. Even though the music is really complicated, they still manage to look relaxed while they’re playing and all the time they looked like they were really having fun. Jimmy later told me that this is one of his favourite Gigs as there’s so much scope for him to stretch his playing. Â After the gig, there was none of the prima-donna behaviour from this trio. They were straight out into the audience signing autographs, posing for photos and happily talking to anyone who wanted some attention. I went home feeling that this had been one of the best gigs I’d ever been to, all because I’ve made the effort to be part of the bass community. This entry was posted in Gigs and tagged Alembic, Allan Holdsworth, bass, Gary Husband, jazz fusion, Jimmy Johnson, level 42. Bookmark the permalink. ← GAS + PayPal = New Guitar Day!